Bryce reads his letter in front of a bunch of cameras. But what he does not know is that his mother is actually watching him on a screen as he reads the letter. At the end of the video, she surprises him by coming out to give him a hug. Bryce’s tender relationship with his mother is obvious by the way both of them get very emotional as he reads his handwritten letter. It is clear that Bryce’s words really come from the heart and that he is a little bit hesitant to share his personal feelings on camera. The way that Bryce feels about his mother reflects his Mormon values. As a Mormon, he believes that families are central to God’s plan for us and that we can be with our families for eternity, even after this life. That is why Mormons especially work to cultivate strong relationships with their family members. The role of being a mother is especially valued and respected by Mormons because of their extremely important role of loving, teaching, and raising the children God sends to them. What would the world be like without good mothers? Below is ESPN’s video of Bryce’s heartfelt letter of gratitude to his mom. 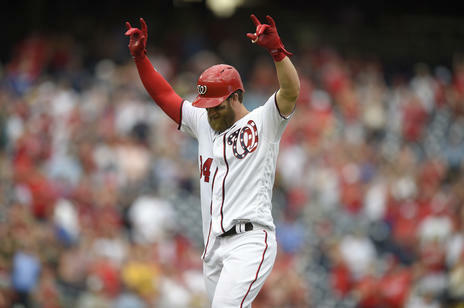 Bryce Harper, Vegas and a 421-Foot Home Run Bryce Harper Wins the 2018 Home Run Derby James The Mormon Opens Up In New Interview Cedar Breaks Releases “Ayre” Music Video Jeremy Guthrie is called as a Mission President to Texas.